Sky Digital has many Interactive services, that give the viewer the power to be part of or get more involved in the programmes. There are plenty of offers available through Sky Interactive services. Look for the RED button while watching TV, this indicates that interactive services are available, allowing you to get more involved in the programme being broadcast. Many services require a connection to a U.K. landline. Tune into Sky Active every day and you’ll find a line up crammed with loads of great stuff including Entertainment, Puzzles & Games, Jackpots, Health & Lifestyle. Navigate yourself to the Shops & Offers area for a shopping spree for the latest bargains and ideas for breaks and last-minute getaways. You can chat to other like-minded people and even meet someone special in the Dates & Mates area, or place a bet in our Sports & Betting Zone. And, if you’re looking for the perfect job, your dream home or a new car, check out the Info & Services area for the answer. 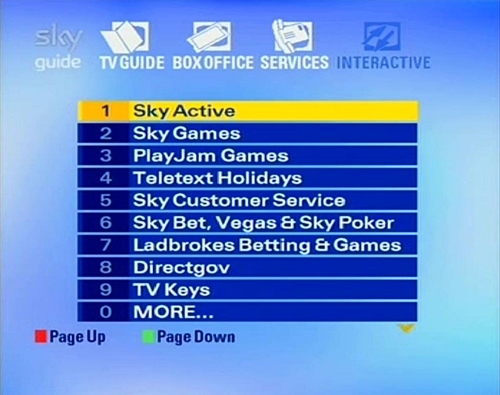 Many of the features on Sky Active require you to be connected to a UK landline. With Teletext Holidays TV on Sky channel 665, you can now see the resorts and destinations before you book. The channel features all of the deals available through the analogue service and website. You will find bargains from a selection of the UK’s most popular holiday brands including First Choice, Thomsons, Cheapestflights.com, Hays Travel and Freedom Direct. If you’re interested in a holiday different from the one being broadcast on the channel or want to check some destination guides or holiday ideas, you can search through thousands of more package holidays, flights, UK breaks and cruise bargains using the free digital text service by simply pressing the TEXT button on your Sky remote. The digital text holiday pages can also be accessed by pressing INTERACTIVE on a Sky digital remote control and selecting Teletext Holidays. Some services require that you are connected to a UK landline. Challenge, test and tease yourself here with the best games for all the family by pressing Yellow from the Sky Active front page and selecting Puzzles & Games. Choose from a great selection of games, from word games such as Word Crunch, quiz games like Who Wants To Be A Millionaire, kids’ games such as Looney Tunes and old classics like Monopoly, Scrabble and Tetris. Or you could even pit your wits against Trivial Pursuit Cash Quiz and see if you can win instant cash by answering questions on categories including Art and Literature, Science and Nature and Sports and Leisure. Within Entertainment, you can also check out the film showing times for your local cinema, and book tickets at ODEON cinemas – all through your TV. There’s also a brilliant What’s On Guide with information on local events including music to suit all tastes, local attractions, comedy & club nights, festivals, ideas for family days out and more. You can even book to see shows, theatre performances and gigs with Lastminute.com and Keith Prowse Tickets using your remote control. In Health & Lifestyle, you’ll also find the indispensable Family Active service for new parents which allows you to message a midwife and get a personalised reply, or send messages to other mums to get their hints and tips on bringing up baby. You will even find a directory of baby names if you’re looking for inspiration when it comes to naming your little one! Plus you can shop for pharmaceutical and baby care items from the comfort of your armchair. Searching for something special or just fancy a browse for a bargain? Make sure you get down to Shops & Offers for thousands of products, from toasters to TVs, straight to your door. If you’re fed-up of leafing through the endless directories clogging up your home, then visit the Info & Services area. It’s the first place to look for a phone number, credit card, job, house, car, motorbike – in fact, pretty much anything you could need! You’ll also find hints and tips on landing that perfect job, buying or selling your home or finding the right car for you. Whether you’re one for the horses, a footy fanatic or just fancy a wager on the latest reality TV show, visit the Sports & Betting area. Here, you can place bets with one of our bookmaker partners on a whole range of sports and more, plus pick up our tipster’s selections for upcoming events. (You must be over 18 to place a bet).